Today there is some blue sky visible in breaks between the clouds and the sun occasionally manages to shine through. The sea is still very boisterous and knocking us around at will, so moving around the boat is a bit tricky, but we are making good progress towards Coffs in 25-30 knots of wind and are on target to be there tomorrow morning. Since we gybed yesterday we are now sleeping on the port side settee, which is rather like a baby’s cot when the lee cloth is up. Doing any paperwork at the chart table requires wedging oneself in and bracing hard to avoid flying out again. All good fun. 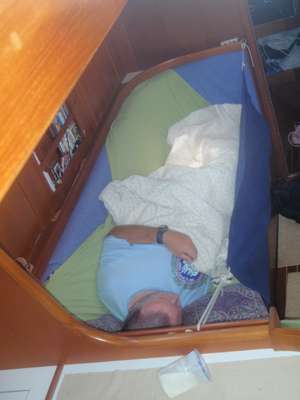 Skipper snoring in the ‘cot’. Attempting to make a log entry. We got our first indication that we are nearing land today, even though we were still 80 nmiles out, when the VHF radio burst into life and a voice informed us that Cape Byron Marine Volunteer Reserve will give weather on request. I wondered if that meant they would take orders, because if so I would like 15-20 knots on the port quarter and flat seas. Please. We called Australian Border Protection on the satphone to advise them that we would be arriving in Coffs Harbour tomorrow morning, early, and to ask for instructions. A very nice chap called Anthony gave us all the necessary info. We could drop the anchor, raise the Q flag and stay on board until Monday if we would like. 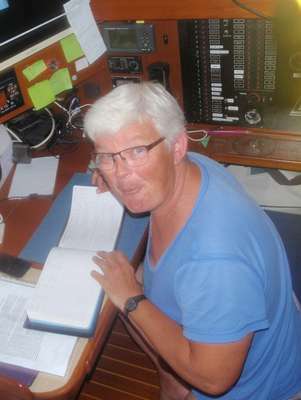 Alternatively, we should call them in the morning and they will contact the marina to find out which berth we had been allocated, and go to the berth to receive us. We must not go to a berth unless there is an Official there to meet us. All very clear and straightforward. We had an email from Rod and Mary to say they arrived safely in Bundy on Wednesday, which we were so pleased to hear, and are looking forward to our own landfall at Coffs in less than 24 hours time. Hurrah!